Cauliflower seems to be latest vegetable in the spotlight, at least from many of the blogs I have been receiving. It is not one of those vegetables I use very often unless I have a specific recipe. It is a versatile vegetable to be used in salads, casseroles, soups or vegetable side dish and on a pizza or stir-fried frozen cauliflower. 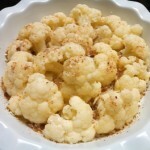 There are several ways to cooking cauliflower and other fresh vegetables. To have them keep their food value and looking fresh and delicious it is best to “undercook”, that is, to cook the vegetables as short as time as possible and still be tender not over cooked. The cooking time will vary the cooking method. Here is a list of methods to cook fresh vegetables: steaming, boiling, pressure cooking, braising, baking, frying and roasting. Steaming Cauliflower cover over 2 ” water for 5-7 minutes. 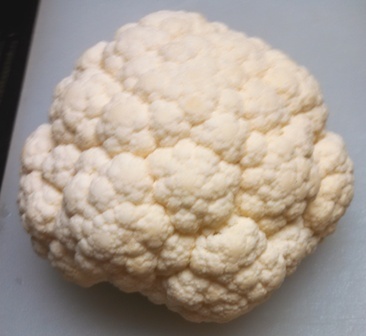 Cauliflower can provide the healing powers to boost the immune system and inhibit tumor growth. Vitamin C and vitamin B folate support the immune system. To keep the nutrients at the peak, choose solid white heads without brown spots. Eating raw or steamed cauliflower provides the most nutrients. Store with the steam down to prevent excess moisture in the florets. Looking through an older cookbook, I found this recipe for Cauliflower with Mornay Sauce a French cheese sauce. 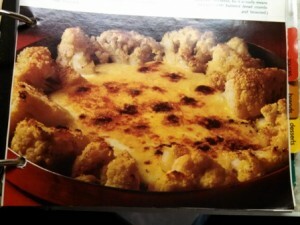 It is cauliflower florets steamed then covered with bread crumbs and melted butter as an au gratin. The Mornay Sauce base is Béchamel Sauce, a basic medium thick white sauce, with the added butter and cheese. This is poured in the center of the cauliflower and browned under the broiler. The Cauliflower with Mornay Sauce was very good even though the finished dish did not look like the picture. I also used all the cauliflower in the casserole. I should have cooked the white sauce longer before adding the cheese. The original recipe called for Parmesan cheese, I used Pecorino-Romano and too few bread crumbs. The end recipe turned out to be closer to cauliflower soup and delicious anyway. 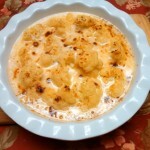 An elegant cauliflower casserole is served with a generous sprinkling of bread crumbs, butter and a French cheese sauce broiled to brown the crumbs and sauce. Basic White Sauce or Bechamel Sauce as follows. Wash and trim cauliflower into florets. 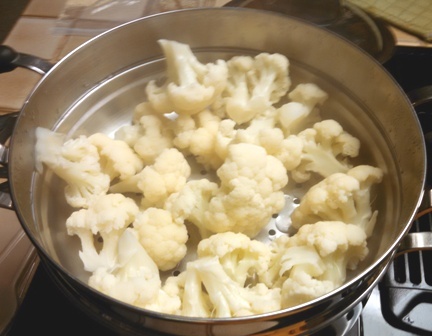 Steam the cauliflower until tender, 5-7 minutes over 2 inches boiling water. Arrange cauliflower around the edge of casserole. Melt the butter in a medium sauce pan. 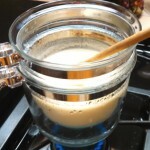 Gradually stir the milk, constantly stirring or use whisk to blend. Cook until sauce is thick. Add the butter in small pieces. Stir in the Parmesan cheese, beating until the butter is melted. Generously sprinkle bread crumbs over the cauliflower. Spoon Mornay Sauce into the middle of baking dish. Broil until the crumbs are lightly browned. Swiss cheese is often used in the Mornay Sauce, you may prefer other cheeses. Less salt may be better if the cheese is especially salty. Inspired by The Creative Cooking Course, 1973. Here are more cauliflower recipes. Check out these links. Julia Ann and cookbookinabox® in partnership with Netta Belle’s Choice® bring you great recipes for your cooking experience. ©2007-2018 Netta Belle’s Choice® The Art of Gourmet Cookery® cookbookinabox® “Reg. U.S. Pat. & Trdmk. Off.” Reg. “Trade-marks Canadian Intellectual Property Office. “Netta Belle’s Choice® The Art of Gourmet Cookery® cookbookinabox®. All rights reserved. This entry was posted in Sauces, Vegetables & Side Dishes and tagged Bechamel Sauce, Bread Crumbs, cauliflower, French white Sauce, Mornay Sauce, pecorino ramano, steamed vegetables, White Sauce on January 11, 2016 by Julia Ann.